NO FEE''�Press Eye Ltd - Northern Ireland - 15th October 2008 Picture by Matt Mackey''Some of the drugs surrendered in Kilcooley over the past nine months. "''KILCOOLEY ANTI-DRUGS SCHEME HAILED A SUCCESS' 'A community-led anti-drugs project piloted by the Kilcooley Community Forum, PSNI and other local agencies has been hailed a great success. ' 'The KEEP SAFE (Kilcooley Education and Enforcement Programme with Substance Awareness for Everyone) initiative was launched in January in a bid to address issues of drug abuse and drug dealing in the Kilcooley area. ''Since then, 3394 units of drugs, including ecstasy tablets, prescription drugs and a small quantity of cocaine, have been collected from two drop safes in Kilcooley.' 'A community survey conducted by North Down District Policing Partnership found that 88% of respondents supported the KEEP SAFE initiative, with 96% wishing to see it rolled out across North Down. A two-month long drugs blitz by police in District F, which includes Dungannon and Cookstown, has resulted in 50 arrests, 234 searches and 117 drugs seizures. The major operation was launched on February 9 to disrupt and arrest drug-dealers operating at street-level within local communities, according to Chief Inspector Jane Humphries. It follows concerns that Tyrone and Fermanagh may have become a trans-shipment point for international drug crime bosses. In November, police uncovered one of the largest amounts of cocaine ever found in Northern Ireland at a Ballygawley premises. The discovery prompted a warning from former police chief Alan McQuillan that the region was becoming a ‘soft touch’ for international drug smugglers. About 50 kg of the drug was found packed into suitcases at the Dungannon district premises. 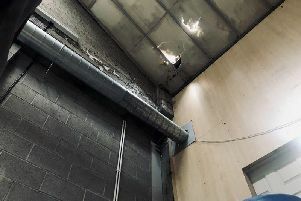 In an unconnected incident, 20 kg of cocaine was also seized in a shipment police believe was bound for Fermanagh. Mr McQuillan said the two consignments could have been worth between £10m to £14m on the street. “These huge quantities of drugs are moving through Northern Ireland. It is being used as a trans-shipment point and some of this is probably for the Irish Republic and some for the United Kingdom,” he said. “Sadly, Northern Ireland now seems to be a soft touch for this because we don’t have the National Crime Agency here and there is a glaring gap in our defences. Mr McQuillan said the drugs had been discovered “fortuitously”. He said cuts to police budgets and a skills issue because of the lack of a National Crime Agency made Northern Ireland “a weak link” and an easier way to deliver drugs to both the rest of the UK and the Republic of Ireland. He warned that if the drugs cartels viewed Northern Ireland as a low risk route, then they would use it. Speaking about the crackdown, which ended on March 31, Chief Inspector Jane Humphries said: “We have invested a considerable amount of time and effort into this operation. “Although this operation has concluded, drugs will remain a policing priority. We will continue to disrupt and arrest those involved in the sale and supply of drugs, bring individuals before the courts and work with communities and partner agencies to reduce the threat of harmful and illegal activity. No-one has been arrested over the Ballygawley drugs seizure. A police detective said there was no suggestion that the company based at the premises knew what was in the container. DUP peer Maurice Morrow also warned that Northern Ireland was being seen as the soft option for drug smugglers. “All of us should be alarmed at these seizures, and they beg the question, how many other drug consignments are getting through that we don’t know about”, he said. Across the F District, which includes Dungannon, Cookstown, Fermanagh and Omagh, the number of drug seizure incidents in 2014/15 decreased compared with 2013/14, falling from 359 to 343. A total of 11 cannabis farms were discovered last year in District F.
Further crime figures released by the Police Service of Northern Ireland show that there was a 1 percent rise in reported crime in the F District over the past year. However, month by month, the number of crimes has been declining since August.